A couple years ago I wrote a post about our feathered guest. Well, after a one year hiatus, apparently Ladybird found love again. 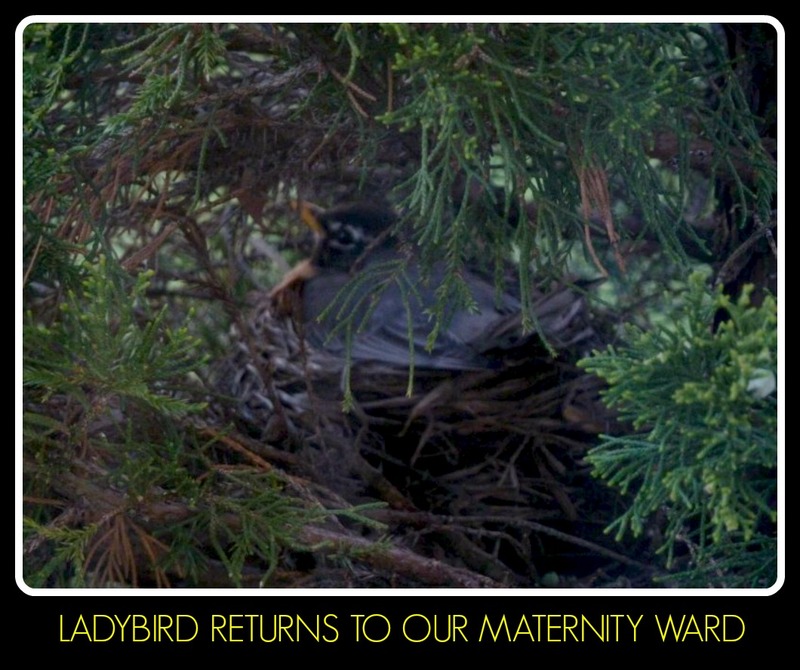 Yes, Ladybird has returned to the bush outside of our home and turned it into her maternity ward. For 3 years straight, my family and I have been hosting an uninvited guest. This guest comes to our home and stays for weeks at a time. Not only that, this guest goes through a major life cycle event each visit. Each spring the 7-foot bush that stands right next to our front door turns into a delivery ward as “Ladybird” (my children named her) builds her nest, lays her eggs, sits atop her eggs, hatches her babies, cares for her babies, and ultimately sends her babies away. The whole process seems to take about six weeks. This scene has served as an up-close Discovery Channel program for my family, and we love it. With great excitement and anticipation, my children follow Ladybird and her flock (this year she laid three blue eggs). They peek their heads around to check out the progression of nature each time they pass the tree. Clearly, Ladybird did not select our house for the peace and quiet. My wife takes pictures of each stage. I give out cigars when the babies are born to celebrate the blessed day. Well, maybe not, but there is a palpable energy in our home when Ladybird’s chicks are hatched. This is the closest my wife and I will come to extending our family, and the closest my children have got to a pet. I’m not sure how many more years Ladybird will be using our home as her nursery. This year Ladybird was later than usual. She also flew away anytime someone walked past her nest. This begs the question – where is her maternal instinct? Also, what about a father? Would it kill him to stop hunting for worms and check up on his family? Well, I do not know much about birds and am not an animal person by nature. But Ladybird has become a part of my family experience, and taught us a bit about nature. We look forward to having her come back in the future, and the best part is we don’t have to prepare or clean up. This entry was posted in Family and tagged Birds, Children, home, Nature by lardavbern. Bookmark the permalink. This is a wonderful refreshing story about nature. It must be a joy to have such a visitor every year. And, I love the name – Lady Bird. I suppose ice cream cones would be more appropriate for certain people – like me! I am not a cigar person. How cool this must be for your family to experience. Something to look forward to each year and herald the coming of spring. And give a biology lesson to boot! It really is. The babies were born today and my older son in particular was excited. We have a family at the back door, and a huge family at the front door. Last year we lost one of the back door babies… I found the egg. This year we lost one of the front door babies. Breaks my heart, but I love the circle of life! Except, the front door family is clogging up my gutters! I’m glad that Ladybird returned this year! Me too. That family at the front door must be big packers to be clogging up your gutter. It would be nice if they would contribute to the mortgage. What an honor for your family! That would be so much fun to watch the whole process. It will be sad when she stops coming altogether. Yes, it will be. I hope she has a few more years left or maybe other could take her place. What a lovely learning experience for you and your family! Growing up we had access to the family farm where my mom raised. I collected eggs from the hen house, held day-old kittens, petted newborn calves, watch the corn fields explode from bare soil. The one thing I regret about raising my kids in town is that they have never experienced life the same way I did. I’m glad your family is getting a bit of that. Yes, I think this as close as we will get to living on a farm.